Reprinted from Pantex: Pantex recently reached a major milestone when they passed 5 million hours without a Lost Time injury. From December 20, 2016 to December 2, 2017, Pantexans worked 5,979,716 hours without a Lost Time injury. Jimmy Rogers, Pantex Safety and Industrial Hygiene manager, said in November2017 Pantex received two recognitions from the National Safety Council. 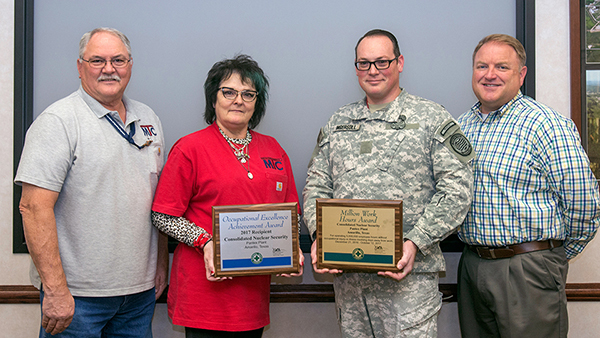 The first was the Million Work Hours Award – noting the more than 5 million hours worked without a Lost Time injury and the second, the Occupational Excellence Achievement Award – awarded to companies that have Lost Time injury cases equal to or less than 50 percent of their industry classification code. From King5.com: The Washington state Senate Labor and Commerce Committee on Wednesday revived a bill to help sick Hanford workers. House Bill 1723, initially sponsored by Rep. Larry Haler, R-Richland, died in the legislative process last year. It would give workers who come down with certain illnesses the presumption that their exposures to chemicals, heavy metals and/or radiation at the nuclear cleanup site caused their diseases such as cancer, toxic encephalopathy (dementia) and lung disease. That presumption is meant to help them get their worker compensation claims accepted. 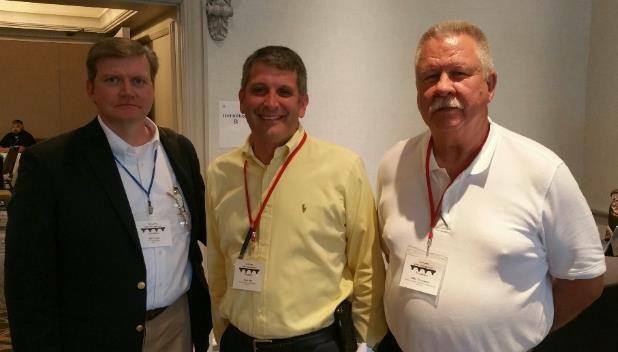 The 30th annual Labor-Management Conference was held in Nashville at the Music City Sheraton. CNS Vice President and Y-12 Site Manager Bill Tindal, along with Y-12 labor officials, were on hand to accept recognition for Y-12’s support of the Tennessee Labor Management Foundation. Tennessee Department of Labor and Workforce Development Commissioner Burns Phillips, was the keynote speaker at the conference’s welcoming banquet. Metal Trades Council of Amarillo donated $1,500.00 in December 2017 to the High Plains Food Bank. Their tremendous buying power will provide 7,500 meals to the local community, that’s 5 meals for every dollar spent. Thank you to all the Unions represented by the MTC at Pantex! On April 18, 2016 MTD President Ron Ault presented the newly formed Rhode Island Metal Trades Council delegation with their official Charter from the Department. In attendance were President Ault, Michael Sabitoni/LIUNA, Roy Coulombe/Ironworkers, Justin Kelley/IUPAT, Michael Daley/IBEW, Tim Byrne/UA and Scott Duhamel/IUPAT. The Metal Trades Department conducted Steward training on March 24th & 25th at the Portsmouth MTC. Topics covered included steward responsibilities, grievance preparation and handling, had a hands-on contract exercise for stewards with follow-up on CBA fundamentals, Metal Trades Department policies and brief history, some union history, introduced and explained the MTD internal organizing program, basic organizing, how to talk to workers one-on-one, did role play for new worker organizing, provided tools for stewards to explain what it means to be union with handouts, provided an introduction to speaking in preparation for them to be successful in the actual role play done in the classroom, and leadership training.